The state of Colorado wants to do everything it can to facilitate fossil fuel development, even if that means putting drilling rigs in the middle of housing areas. The city of Longmont doesn’t think drilling should take place amidst residential areas, but the Colorado Oil and Gas Conservation Commission doesn’t care about local controls – they’re pro-drilling no matter the consequences. So the Boulder County DA is suing Longmont to invalidate the city’s common sense regulations. The federal government cracked down on Colorado medical marijuana dispensaries that were within 1000ft of schools earlier this year. Does anyone think the feds will crack down on drilling rigs within 1000ft of those same children’s’ homes? Toxic pollution from drilling is okay, but not a facility that has similar legal rights to exist and participate in commerce. Does the state really want to fight for fossil fuel drilling instead of children? What kind of public policy is that? Categories: business, environment, framing, policy | Tags: medical marijuana, oil and gas drilling | Permalink. The Atlantic basin has been relatively quiet so far this year. While four tropical storms formed prior to July (the earliest on record), all of them were weak and short-lived since they formed on the western side of the basin. This situation is largely due to higher wind shear than normal and a strong high pressure region, which pushes air toward the ground instead of lifting it. The National Hurricane Center in Miami, FL has issued an outlook for an area of disturbed weather currently centered 1,150 miles southwest of the Cape Verde Islands. The center is giving Invest 99L a 20% chance of tropical cyclone development within the next 48 hours – still pretty low, which means the system bears watching as it makes its way across the Atlantic over the next week. The system is near 9°N 36°W. 9°N (click for a decent IR satellite image), which is relatively close to the Equator as far as tropical systems are concerned. Disturbed weather at this latitude have a hard time acquiring the angular momentum necessary to grow into a cyclone. If the system were to angle northwestward for a few days, it would stand a much better chance of development by the time it reached the Lesser Antilles. Wind shear is minimal in the area (5-10knots). Sea-surface temperatures have been warm enough for tropical cyclone development for months, so that’s not an issue with this system. The GFS ensemble members project Invest 99L to move through the eastern Caribbean island chain sometime next week. The specific timing for this will have to wait until we’re much closer in time. Categories: science | Tags: 2012 Atlantic hurricane season, African tropical wave, Invest 99L | Permalink. The data is valid through the 28th of July, 2012. As I’ve stated in previous posts, the previous yearly maximum number of occurrences took place in 2005 with 7. So far this year, the temperature has exceeded 100°F 13 times. At this point, I do not expect the NWS to record another 100°F day during the rest of this year. While it has been warmer than normal in Denver, the North American monsoon season has kicked into gear, which suppresses daily maximum temperatures due to cloud formation. The afternoons cannot get as warm with widespread, thick clouds as they could prior to the monsoon when the sun warmed the ground throughout the day. Note that while 100°F day incidence appears to be increasing, I am not making any claim as to the statistical significance of such a development. The linear trend (not shown) over the entire dataset is slightly positive, but these events are too rare from which to draw robust conclusions. With only three days remaining, July 2012 has a very legitimate shot at the hottest July in 140 years’ of record-keeping. If the average temperature remains near 78.9°F, 2012 will also beat out 1934’s 77.8°F by over 1°F!! And while the 1930s were a very warm decade, note further that 5 of the warmest Julys on record occurred during the 2000s. # Warmest Month in Denver History. If July remains anomalously warm from today through Tuesday, July 2012 will be the warmest month in Denver history. This follows on the heels of the hottest June on record: 75°F, which beat the old record of 73.5°F (June 1994). 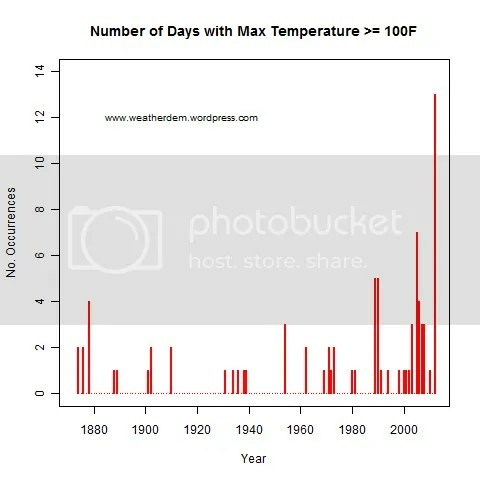 Categories: science | Tags: 100F days, 2012 heat wave, temperature records | Permalink. While 90°F might sound like a low threshold for many across the US Midwest, the total number of 90°F days for Denver in 2012 is racing for the record books. An average year yields 32 90°F days in Denver – or at least an average year in a cooler climate. Through the 26th of July, 2012, Denver, CO has recorded a total of 41 days of 90°F+ maximum temperatures. Wednesday was the last day that could have registered a sub-90°F temperature, but 90°F was the recorded high for the day. As such, the latest streak of 90°F+ days continues: 16! That streak edges out the 15-day streak Denver already recorded earlier this summer. So not only have temperatures been warmer than normal more often than normal, they’ve been warmer than usual for extended periods of time. That means that ecosystems haven’t had their normal chance to recuperate from such high temperatures – a point that I will spend more time on in an upcoming post. That streak is likely to continue: the forecast for the next 7 days includes highs in the mid- to upper-90s. Denver could witness a July with only 4 days below 90°F. So far this month, the average temperature departure from average is +4.7°F. That isn’t as high as June (+7.6°F), but the general trend is clear: 2012 is very warm for Denver, CO and other locations across the mid-section of the US. Categories: drought, global warming, science | Tags: 100F days, 2012 drought, 2012 heat wave, 90F days, heat wave, temperature records | Permalink. This is a short update to a recent series on this topic (last post here). Through the 23rd of July, 2012, Denver, CO has officially recorded a total of 13 days of 100°F+ maximum temperatures. The previous year with such heat was 2005, when the NWS recorded 7 such days. We are on the cusp of doubling the previous number of 100°F+ days. Due to Denver’s latitude (~40N) and altitude (~5,200 ft. above sea level), 100°F days are rare. This year is developing a series of very anomalous heat and drought observations. Denver has also now recorded 38 days of 90°F+ days, so only 12 more such days need occur the rest of this year to make the top-9 list. Denver is also in the midst of another consecutive 90°F+ day streak: 13 through yesterday (11 Jul – 23 Jul). That is in addition to the previous 15-day streak the city recorded from late June through early July. The streak will continue through today before slightly cooler temperatures (only 89°F?) occur Thursday, then right back into the 90s starting Friday. The thought of autumn and cooler temperatures is very appealing. According to data released by NASA and NOAA this week, June 2012 was the 4th warmest June globally on record. NASA’s analysis produced the 4th warmest June in its dataset; NOAA recorded the 4th warmest May in its dataset. The two agencies have slightly different analysis techniques, which actually helps to reinforce the results from each other. June’s global average temperatures were 0.56°C (1.01°F) above normal (1951-1980), according to NASA, as the following graphic shows. The warmest regions on Earth coincide with the locations where climate models have been projecting the most warmth to occur for years: high latitudes (especially within the Arctic Circle in June 2012). The past three months have a +0.59°C temperature anomaly. And the latest 12-month period (Jul 2011 – Jun 2012) had a +0.52°C temperature anomaly. The time series graph in the lower-right quadrant shows NASA’s 12-month running mean temperature index. The recent downturn (post-2010) is largely due to the latest La Niña event (see below for more) that recently ended. As ENSO conditions return to normal, the temperature trace should track upward again. Figure 1. 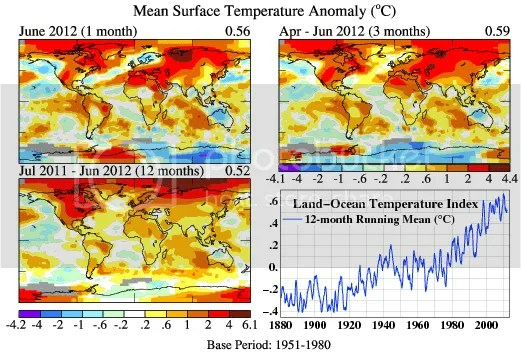 Global mean surface temperature anomaly maps and 12-month running mean time series through June 2012 from NASA. According to NOAA, June’s global average temperatures were 0.63°C (1.13°F) above the 20th century mean of 15.5°C (59.9°F). NOAA’s global temperature anomaly map for June (duplicated below) reinforces the message: high latitudes continue to warm at a faster rate than the mid- or low-latitudes. Unfortunately in June 2012, almost the entire Northern Hemisphere was warmer than normal. Figure 2. Global temperature anomaly map for June 2012 from NOAA. Figure 3. 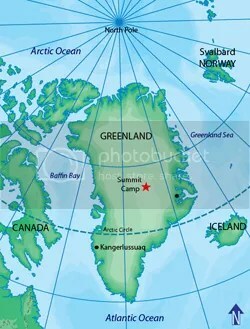 Location of Summit Camp, Greenland. The station is in the middle of the massive Greenland ice sheet at ~10,500ft elevation. It is difficult to warm this area enough to register above freezing temperatures. Multiple stations on the top of the ice sheet similarly observed record warm temperatures recently. What happens when air temperatures are above freezing with the mid-summer sun shining down for most of the day? Record flooding occurs. Figure 4. Time series of weekly SST data from NCEP. (NOAA) The highest interest region for El Niño/La Niña is NINO 3.4 (2nd time series from top). As the second time series graph (labeled NINO3.4) shows, the last La Niña event hit its highest (most negative) magnitude more than once between November 2011 and February 2012. Since then, SSTs have slowly warmed back toward a +0.5°C anomaly (y-axis). La Niña is a cooling event of the tropical Pacific Ocean that has effects across the globe. It is therefore significant that the past handful of months’ global temperatures continued to rank in or near the top-5 warmest in the modern era. You can see the effect on global temperatures that this last La Niña had via this NASA time series. As the globe returns to ENSO-neutral conditions this summer and early fall, how will global temperatures respond? Remember that global temperatures typically trail ENSO conditions by 3-6 months: the recent tropical Pacific warming trend should therefore help boost global temperatures back to their most natural state (i.e., without an ENSO signal on top of it, although other important signals might also occur at any particular point in time). Looking further into the future, what will next year’s temperatures be as the next El Niño develops (as predicted by a number of methods, see figure below)? Figure 5. Set of predictions of ENSO conditions by various models (dynamical and statistical). To be considered an El Niño event, 3-month temperature anomalies must be measured above +0.5°C for 5 consecutive months. Approximately 1/2 of the models are predicting a new El Niño event by the end of this year. The other models predict ENSO-neutral conditions through next spring. Categories: global warming, NASA, NOAA, science | Tags: climate change, climate change effects, global temperatures, global warming, global warming effects, NASA, NOAA | Permalink. Here, in a sneak peak of my monthly `State of the Poles` post, I wanted to mark a significant event: the area of Arctic sea ice has fallen below the climatological minimum. This occurs with ~6 weeks left in the Arctic melt season. In similar fashion as in other recent years, UIUC data show Arctic sea ice area values at a stunning -2 million sq. km. below the average value for this date in time. Instead of 6.5 million sq. km., today’s value is 4.5 million sq. km., the record lowest for this calendar day. Conditions on the Pacific side of the Arctic sea ice pack (another graphic here) are starting to deteriorate, so rapid melt of additional hundreds of thousands of sq. km. of sea ice could occur in the next month or so. The recorded history yearly minimum sea ice area is ~2.91 million sq. km. Stay tuned for this year’s minimum, which will likely occur in early September. Categories: global warming, science | Tags: arctic sea ice, climate change, climate change effects, global warming, global warming effects, UIUC | Permalink.